Got some great items for you to grab on your weekend. Rather than go into detail, I'll let the items speak for themselves. Alexohol is celebrating a birthday and is giving US the presents! Guys and girls can both enjoy this one. Both completely free. Click here to get yours now! As the pic states, get this skin for FREE as a group gift! Click here to TP there now. Click here to take advantage of Heartsicks skin sale! 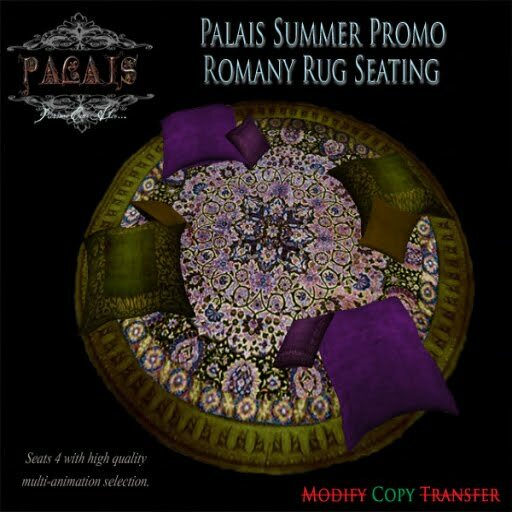 ROMANY RUG SEATING - Seats 4 with multiple animations options. Got a great freebie you want posted? Let me know! In game as Honey Hoffman or email me at tristalyn@gmail.com.